More than 200 empty pairs of firefighter boots lined the steps of the Rotunda in San Francisco's City Hall on Wednesday. Each pair represented a local firefighter who lost his or her life "with their boots off" due to cancer in the last 14 years, said Tony Stefani, president of the San Francisco Firefighters Cancer Prevention Foundation. "In just the last three months, we've had two active and four retired firefighters die of cancer," said Stefani, a retired San Francisco Fire Dept. captain and cancer survivor, in a interview before the event. The display is one of at least 15 "Give Toxics the Boot" events around the country this week. From Spokane, Wash., to Augusta, Maine, firefighters are calling for stricter regulations on flame retardants and other toxic chemicals they say are causing cancer and other diseases among their ranks. "We take every precaution we can to minimize our exposure and risk, yet we're still being exposed to these chemicals on a daily basis," said Emmett McNamee, a 20-year veteran Spokane firefighter. "And these are bio-accumulative. They build up in our systems." Public health advocates are standing alongside firefighters in the heated battle. "Our first responders and firefighters are disproportionately exposed and affected by the chemicals that are in our homes," said Lindsay Dahl, deputy director for the non-profit Safer Chemicals, Healthy Families, one of the organizations participating in the campaign. "They serve, just like pregnant women and children, as canaries in the coal mine for the health effects we're seeing from chemicals we're exposed to every day." To fight a fire means confronting a toxic soup of burning chemicals and their byproducts, including dioxins, furans and formaldehyde. Many of the most toxic fumes released by today's fires actually come from chemicals added to everything from clothes to couches to computers in an effort to retard flames. But, as an investigation by the Chicago Tribune uncovered, those additives may offer no meaningful fire protection. "All of us are exposed to these indoor chemicals, and it's not only flame retardants," said Susan Shaw, director of the Marine Environmental Research Institute. "That's bad enough. But firefighters are exposed to exponentially higher levels of these compounds when they go into a house fire." A firefighter's exposure to chemicals can continue long after the blaze is out. Chemicals may linger on the skin, uniform, respirator, helmet and other gear. And if a firefighter wears any of that stuff home, their family may be exposed as well. "Black soot used to be worn as a badge of honor," added Shaw, also an environmental health professor at the State University of New York at Albany's School of Public Health. "Now it represents a really frightening situation." Shaw and her colleagues recently tested the blood of 12 California firefighters immediately after they responded to an alarm. The results, published in June, showed significantly greater concentrations of flame retardants and other modern household chemicals in the firefighters compared with average Americans. Levels of polybrominated diphenyl ethers, or PBDEs, one common flame retardant, were three times higher in the firefighters' blood. A separate study, published in October by the National Institute for Occupational Safety and Health, evaluated the health of nearly 30,000 career firefighters in San Francisco, Chicago and Philadelphia. Researchers found higher rates of prostate cancer, kidney cancer, multiple myeloma, and other cancers compared with the general population. "Cancer is sweeping through the fire service now," said Shaw. To better clarify connections with chemical exposures, Shaw and her team have begun recruiting 100 Maine firefighters for a 20-year study, in which they will monitor chemicals and markers of disease in their blood as well as track cancer, neurological and heart disease. Stefani noted that San Francisco firefighters are also coming down with Parkinson's disease at a seemingly high rate. Firefighters like Spokane's McNamee aren't waiting on data before taking action. The issue became very "near and dear" to McNamee last year, he said, when his fellow firefighter and good friend died from multiple myeloma. "Now there are two other gentlemen battling cancer in my firehouse," said McNamee, who helped organize an event in Spokane on Wednesday. "Of a group of 28, that's three gentlemen in their 40s in just the last year." McNamee's firehouse recently got together to watch the new HBO documentary on flame retardants, "Toxic Hot Seat." Its makers, and the International Association of Fire Fighters, are participants in the "Give Toxics The Boot" campaign. "We can't stand on the sidelines," said Patrick Morrison, a retired firefighter who now works with the IAFF's Occupational Health, Safety and Medicine division. "We added 157 names to a National Fallen Firefighters Memorial in Colorado Springs this past year. Almost 65 percent died from cancer." The HBO documentary, along with the evidence of elevated cancer, has caught the attention of firefighters and public health advocates across the country. While they praise some recent policy success stories -- such as California's new TB 117, which removes a decades-old requirement that flame retardants be included in the filling of upholstered furniture -- they lament sluggish progress in other states, as well as in Washington, D.C., and accuse the chemical industry of deception. "Quite frankly, the chemical companies use methods to persuade us that, to me, are very questionable," said Morrison. Advocates point to Dr. David Heimbach in particular. The retired burn center director at Harborview Medical Center in Seattle falsely testified to legislators in multiple states about the safety of chemical flame retardants, while on the payroll of a chemical company that manufactured toxic flame retardants. 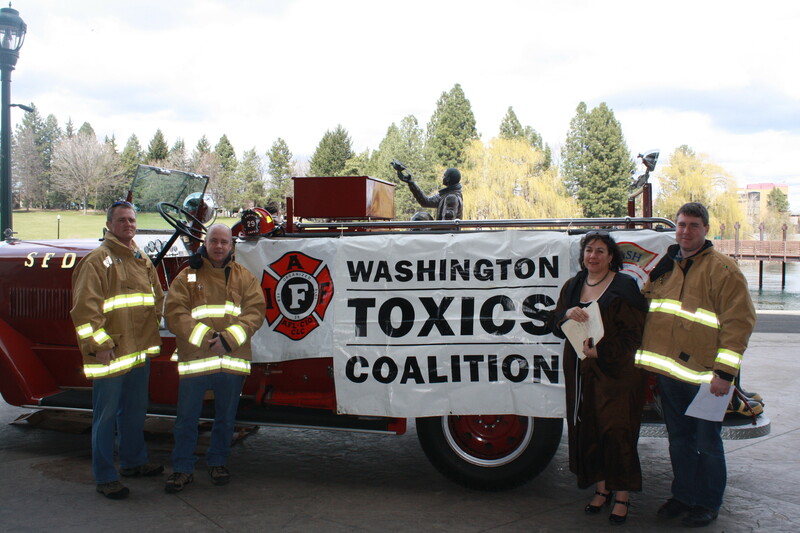 Washington is one of the states in which industry lobbies have successfully thwarted legislation that would ban toxic flame retardants. Washington state Rep. Jason Overstreet (R-Lynden), a firefighter, was among 19 republicans who changed their votes this year in favor of the bill, helping it pass out of the House. He credited "Toxic Hot Seat," which was based on the Chicago Tribune's 2012 report, for swaying his opinion. "It is widely agreed that there are safer alternatives that don't put children's health in jeopardy or place firefighter's lives at greater risk over the course of a career fighting fires," Overstreet co-wrote in a February letter to his colleagues in the state Senate. Meanwhile, the U.S. House has introduced the Chemicals in Commerce Act, a proposed reform for the outdated Toxic Substances Control Act of 1976. The bill has won widespread support from industry groups, but faces strong opposition from environmental health advocates, who suggest it favors the industry. "The bill would not protect firefighters from toxic chemicals," said Dahl, of Safer Chemicals, Healthy Families. Stefani, the former San Francisco captain, said he has a message for the chemical lobbying industry: "We are sick and damn tired of being your canaries sent into the cave every time we fight a fire. We're sick and tired of seeing the men and women of our profession contracting and dying of this insidious disease. "We're not only concerned about firefighters," added Stefani. "We're concerned about the population in general with ongoing, daily chemical exposures."